Nature photos, Alaska photos, scenics and landscapes photos, travel and adventure images and outdoor recreation photos, wildlife and nature images by Carl Donohue. Stock photos, prints and assignment photography available. 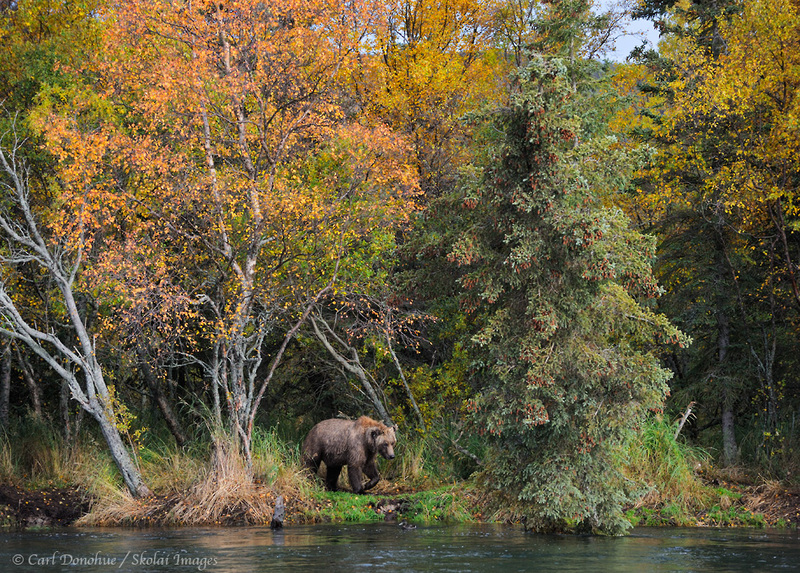 Brown bear in the forest, fall colors, searching for salmon in a river. Brown bear (Ursus arctos) Katmai National Park and Preserve, Alaska. Carl Donohue offers professional stock photography specializing in Alaska wildlife and Alaska landscape photos. On this website you’ll find an assortment of images and portfolios of photos from a wide variety of subjects, locations and interests. Stock Photography available for Rights Managed Licensing. Skolai Images also offers professional prints shipped to your door. Alaska photo subjects include an extensive collection of Wrangell – St. Elias National Park photos, Denali National Park Photos, Northern Lights photos, Arctic National Wildlife Refuge, and wildlife subjects include bald eagle photos, grizzly and brown bears, polar bears, caribou, waterfowl, muskox, Dall sheep photos, moose photos and more. Travel and adventure photos include subjects and locations such as hiking in Denali National Park, rafting in the Arctic National Wildlife Refuge, backpacking, camping, snowshoeing, cross country skiing, even glacier hiking in Wrangell – St. Elias National Park and Preserve, in an ever increasing stock photo portfolio. You’ll also find landscape and scenic tourism and travel photos from Alberta and the Canadian Rockies, including Jasper and Banff National Parks. Photos from the Appalachian Mountains, Great Smoky Mountains National Park, Okefenokee Swamp in South Georgia and wading birds from Florida. Stock photos also include whitewater rafting and kayaking photos in southern Chile, trail running in Atlanta, GA, canoeing in South Georgia and mountain biking photos from Atlanta, GA. Please browse the galleries, and use the dedicated search features of the site to help find what you’re looking for. And, of course, if you can’t find what you’re looking for, please don’t hesitate to give me a call at 770. 952 4549 or email me for more selections. Try the Advanced Search Function. Carl Donohue offers a number of fantastic photo tours and workshops as well. Expeditions Alaska is my main site for tours, but you’ll also find information on some of those tours here as well. Or head on over to Expeditions Alaska for all the details! Great Alaska photo tours. Grizzly bears, Aurora borealis, and grand Alaska landscapes. The perfect opportunity to strengthen your photo portfolio.